Can be used for a variety of conditions (both acute and chronic) including: wound healing, "hotspots", soft tissue sprains, post surgical healing, ear hematomas, lick granulomas, gum disease, and arthritis. Therapy sessions are brief and most pets enjoy the soothing warmth the laser induces. 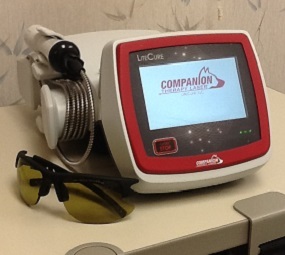 We use laser therapy during almost all surgical procedures in order to speed incision healing time. We also apply laser therapy during dental procedures to soothe gingivitis and heal dental extraction sites.